Jag gjorde en en hel hög med järn-silver-armband nyligen, här är ett par stycken. Nu börjar det kännas som att jag har lite bättre koll på hela processen (ganska annorlunda än med silver, koppar och brons) — och jag har blivit så förtjust i den här järntråden (från Slöjd-Detaljer) att jag nyss köpte två grovlekar till, så : watch this space…. Soldered sterling silver details on blackened, polished iron wire (nickel free). 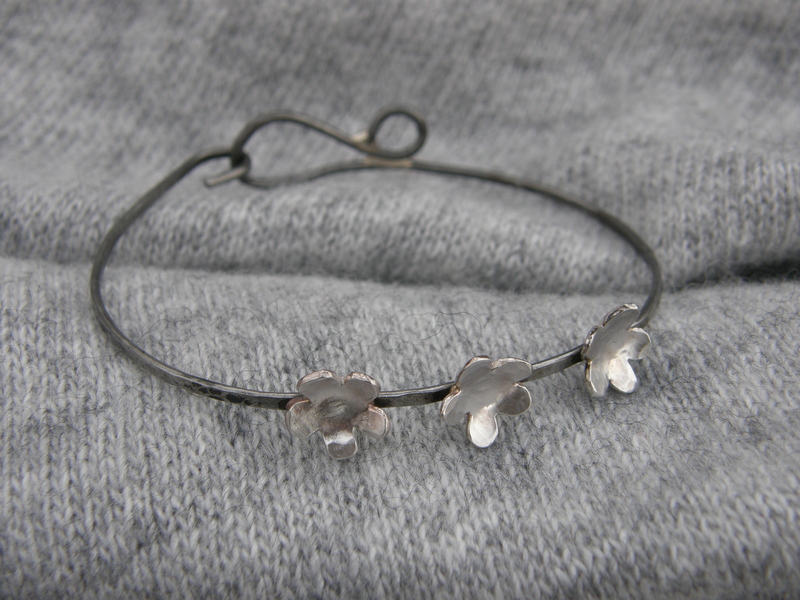 Sterling silver flowers on blackened, polished iron wire (nickel free). Morning, Monica! 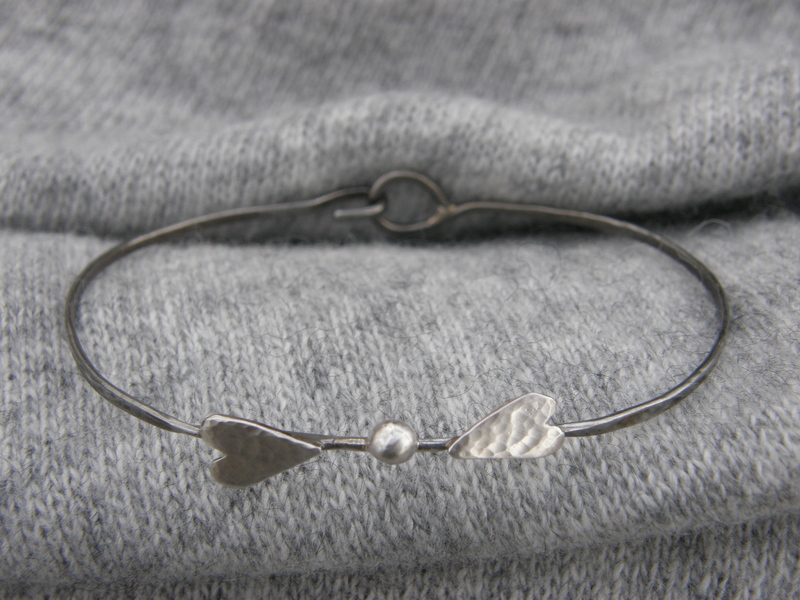 Love it when your posts pop up in my email…these new bracelets are so sweet. I’ve never tried soldering sterling to iron. May I ask what solder you used? Any special tips to share? I love the bright and dark metals together! Hello Lynda! Back from the festivities… glad you popped by! Yes, the contrast is what I like about this combo too. I use hard (or extra hard??) silver solder — the melting point of iron is way above that of silver, so no problem with the high temp, and I learned that the hard solder has more silver in it, and thus remains untarnished for longer. In fact, I’ve seen pictures of pieces with just iron wire bonded by silver solder, no extra silver pieces added; the solder in itself gave that pop of bright white! Use paste flux (mine is from the hardware store, for high temp brazing), and preferably pickle in a mixture of vinegar (or 12% acetic acid from the grocery store…) and 3% hydrogen peroxide (bleach) from the pharmacy — about 50-50 (you should have slightly more of one, but I forget which). Then I polish, heat to darken, dunk in linseed oil to seal the iron, and tumble. That’s about it! Oh, yes, the iron doesn’t transport the heat from the torch in the same way as silver and copper, so you can sort of point-solder details, no need to try heating the piece evenly.